WhatsApp is a very popular app and it is widely used on smartphones, it provides countless features to keep you connected with your loved ones. You can make calls, text, send voice clips, video chat, send files and share stories etc using WhatsApp. It also provides end to end encryption to keep you conversations secure. If you are an iPhone user and deciding to try Android phone but you don't know how to transfer WhatsApp from iPhone to Android then follow this guide, we have covered some of the most common and easy to use methods you can use to transfer all of your conversations from iPhone to an Android phone. There are number of methods you can use to achieve this goal but we have listed some of the most simplest methods you can try to transfer your conversations from an iPhone to Android. We have also explained these methods in step by step guide, follow them carefully. Step 1: Open WhatsApp on your iPhone and go to "Settings". Step 2: New Screen will appear, tap "Chat settings". Step 3: Now tap "Email Chat" from list of options. Step 4: Next you will need to select WhatsApp history that you will like to migrate. Step 5: It will prompt you to send it with media or without media, choose accordingly. One thing must be noted here that if you decide to send media and attachments along with chat then it will take larger size and more time to transfer. Step 6: Now, simply type email and tap "Send". Step 7: Now, login to your email on your Android Phone, you will be able to see all of your conversation. The only downside of this method is that it can transfer all messages from iPhone to Android but it won't sync conversations inside the app. Step 1: The very first thing you need to do is backing up your WhatsApp Messages on your old device(iPhone). 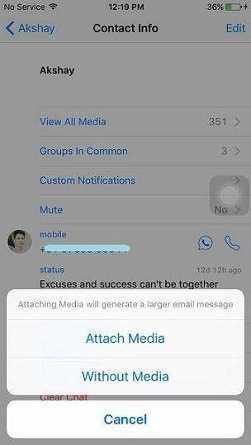 Step 2: Open WhatsApp on your iPhone and open "Settings", a new screen will show up on screen. Step 3: Now, tap "Chats Backup" from the list of options. Step 4: You will be able to see latest backups and you can also manually backup by tapping "Back Up Now" button. 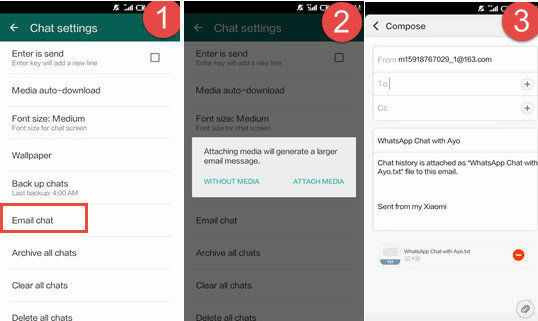 Step 5: Now uninstall WhatsApp from your iPhone and install it on your Android phone. Step 6: Once installed, open it and register your number, a window will pop saying backup is found, simply tap "Restore". WhatsApp conversation from iPhone will be transferred to Android. Step 1: Connect your iPhone to PC but don't start iTunes yet. Step 2: Open command prompt (RUN : cmd) or terminal. Then search for a folder named "whatsapp". You have to use command line:"dir" to see visible contents of the current folder, "dir\a" to see all contents (including the hidden and system) of the current folder or "cd [folder]" to change directory (change folder to). Copy the folder "whatsapp" to your system by using copy [source] [destination]. 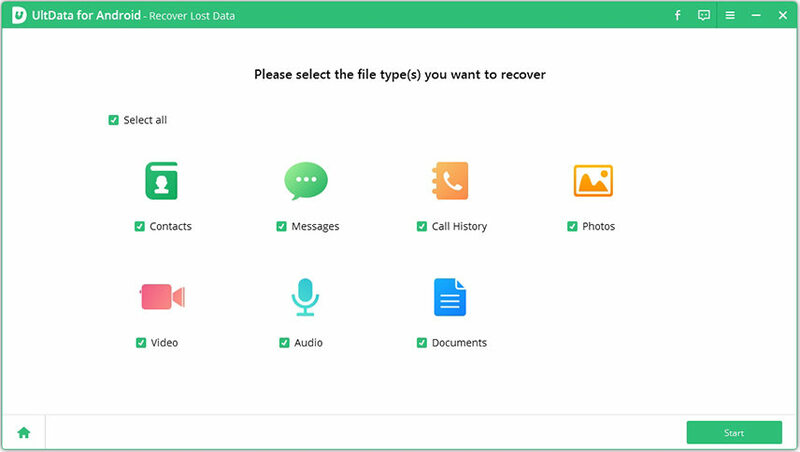 Step 4: Launch WhatsApp on your Android phone, after verifying your phone number, simply tap "Restore" when prompted. Once the progress is done, all of your chats will be restored on your Android Phone. We have covered some methods which you can use to transfer WhatsApp messages from iPhone to Android phone very easily. At the end we have also shared and awesome tool which can be used keep your iPhone healthy and it can also transfer WhatsApp from your iPhone to PC very easily.